Every week we pull together some great recipes from Canadian food bloggers around the web featuring one main ingredient. This week, our ingredient is a reader suggestion that was tweeted to us on Twitter: tea! Tea can add a remarkable depth of flavour to both sweet and savoury dishes and it's worth experimenting with. And with so many types of tea, their are lots of flavour options! Here are a few recipes to get started with. 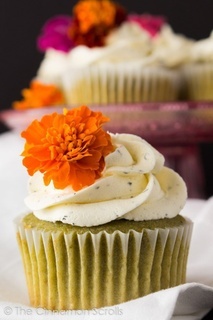 **[Matcha Cupcakes with Jasmine Buttercream](http://thecinnamonscrolls.com/matcha-cupcakes-with-jasmine-buttercream/)** from** The Cinnamon Scrolls**. **[Earl Grey Shortbread Cookies](http://www.thebusybaker.ca/2015/12/earl-grey-shortbread-cookies.html)** from **The Busy Baker**. **[Poached Pears in Earl Grey Tea](http://bethdunham.ca/updatesnews/2014/5/11/poached-pears)** from **Beth Dunham**. **[Vanilla Earl Grey Shortbread Cookies](http://www.cocoabeanthevegetable.com/2016/02/vanilla-earl-grey-shortbread-cookies.html)** from **Cocoa Bean the Vegetable**. **[Matcha Green Tea Muffins With Chia Seeds](http://www.spicyeggplant.com/recipe/matcha-green-tea-muffins/)** from **The Spicy Eggplant**. **[Earl Grey Icebox Cookies](http://www.crumbblog.com/earl-grey-icebox-cookies/)** by **Crumb Blog**. **[Earl Grey Tea Cake](http://www.aprettylifeinthesuburbs.com/earl-grey-tea-cake/)** from **A Pretty Life**. **[Vanilla Ice Wine Tea Cookies](http://www.thefinercookie.com/cookie-recipes/p64nc01mdlr171s3u5dxrk2i41xkmp)** from **The Finer Cookie**. **[Coconut Crème Brûlée](http://bonappeteat.ca/2014/07/08/giveaway/)** from **Bon Appet'Ea**t.
**[Baked Rhubarb and Apples with Earl Grey Tea, Cardamom and Orange Zest](https://tastespace.wordpress.com/2010/06/03/baked-rhubarb-and-apples-with-earl-grey-tea-cardamom-and-orange-zest/)** from **The Taste Space**. **[Heart to Heart Matcha Brownies](https://dishnthekitchen.wordpress.com/2016/01/30/heart-to-heart-matcha-brownies/)** from **Dish n the Kitchen**. **[Chai Tea Latte Ice Cream](http://joandsue.blogspot.ca/2012/04/chai-tea-latte-ice-cream.html)** from **Jo and Sue**. **[Gazpacho with Lapsang Souchong](http://www.superkitchenmachine.com/2013/19537/thermomix-gazpacho-recipe.html)** from** Super Kitchen Machine**. **[Earl Grey Orange Truffles](https://tinysweettooth.com/2016/04/13/earl-grey-orange-truffles/)** from **Tiny Sweet Tooth**. **[Raw Chocolate Matcha Macaroons](http://theteacupoflife.com/2015/11/raw-chocolate-matcha-macaroons.html)** from **The Cup of Life**. A big thank you to all our FBC Members who participated in this weekend's tea recipe roundup. Pancake & Waffle Week - Over 50 Recipes!